It’s mid-June 2017, and the Staples Fire Station in Minnesota is awash with excitement. “This is like Christmas,” said Donald Brusewitz, volunteer firefighter. Christmas? In June? Firefighters and their families, the mayor and members of the community have been swinging by just to catch a glimpse, maybe even climb aboard. Climb aboard what? What’s the attraction? The Staples Fire Department’s shiny new pumper truck. A brand-new, custom-built Rosenbauer two-door commercial top control FX pumper truck. Fire Chief Scott Braith said the department has been working on getting the new truck for two years. The first year included lots of research and conceptualizing, with the actual order being placed last May. It took a year — and lots of collaboration with the manufacturer — to build the truck. After all that, it’s no wonder the department’s fired up. 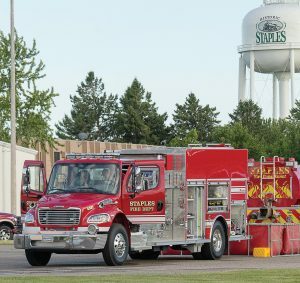 The city of Staples purchased the new truck for the fire department through a cooperative contract from Heiman Fire Equipment, a Rosenbauer dealership based in Sioux Falls, S.D. With the cooperative purchasing process, the city was able to efficiently purchase its firetruck without having to go out for bid. This means it got what it wanted quickly and in a more cost-effective manner. Because the purchasing process was so easy, the city was able to focus its efforts on building the truck. The city ended up with a custom-designed truck with enhanced safety and efficiency features, setting the department up to more effectively carry out its mission of serving the central-Minnesota city and its surrounding townships. Ladders on the new truck are also housed up top, but raise, lower and adjust with the push of a button. All the lights are LED, making the truck more visible when heading out to a call and giving firefighters better lighting once on-site. The new truck includes more spotlights and lighting options, including an automated and fully adjustable center-mounted spotlight. Braith said the committee had the manufacturer configure the pump hookup sites to match its former main pumper, a Rosenbauer from 1997. This will make for a smoother transition. There are a few custom upgrades between the pump system on the older truck and the new, however. On the 1997, the pump controls are at ground level and on one side of the truck, making communication and operation a challenge. On the new truck, the control panel is up on a platform between the cab and tank of the truck, giving operators an elevated 360-degree view. The entire pump system — hose nozzles, hookup sites, levers and gauges — is color coordinated. “This way when someone’s got the hose and they tell you to shut down the green nozzle — there, that’s the one,” Braith said, pointing to a green lever. Braith said the purchasing part of the project was straightforward. The fire department got the exact brand and model of truck it needed, complete with the desired customizations.